While over 200 cloud call Centre solution provider are there in the market, only Aria Telecom offers trustworthy services. Our cloud call Centre service is not only technologically advanced but we offer best post-purchase customer care services. Call Centre solution determines the service level of your business. Selecting the best communication combination give you the wings to spread your brand over customer base. It not only handles your communication services but also ensures that your customers stay connected in the times of unavailability. It comes with fully loaded featuresand supports all kind of communication channel. On-the-go accessible services through mobile and laptop. No IT infrastructure cost needed. Easy on-premise to cloud migration. Easy to afford for small budget businesses. 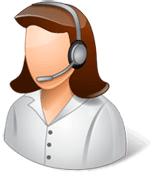 Offer all compact features of call centre with no hassle.